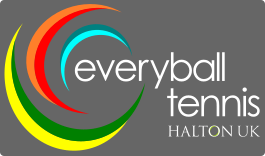 Everyball tennis offers tennis coaching courses and programmes in schools (Community) and clubs (Club and Academy). Our Community programme reaches out to bring fun tennis experiences to our local primary and secondary schools. We are holding Sporty Tots, Mini Red and Junior tennis camps over the Easter holidays. New to tennis? Fancy giving it another go? Maybe the last time you played was years ago at school -- or the closest you've got to a court is watching it on the telly. Either way, we'd love to invite you to Give Tennis A Go! Today sees our first home matches of the season in the National Division of both Mens and Ladies LTA TEAM TENNIS competition. Tougher to find/create in an individual sport like tennis. That's why 'team tennis' at any/every level is so important - being part of something bigger than oneself, looking beyond one's own failures and successes and commiserating and celebrating with others. It's a wonderful thing when this kind of support is genuine, instinctive and immediate - sign of a great culture within a team, programme, organisation that takes real building and nurturing. To all Mums out there, happy mother's day and hope you feel appreciated today! Having just come back from a long family walk with Smithy the dog reminded me how important it is just to take 'time out' from the business and busyness of it all and then picked up this blog from Seth Godin today. Read more about Happy mother's day! The archive of previous issues of the newsletter. I’ve been coaching for 7 years, working with all ages and abilities. Danny's video shows the fun had at previous camps - this year's promise even more. Jemima and friends show where and why a new MUGA would benefit Halton's youngsters (and even those a little older). Part 2 of Mike James's conversation with Jez Groom launching 'Everyball'.